Herefordshire Raceway01544 318334work Go-kartingHerefordshire Raceway’s track caters for arrive-and-drive corporate/private events and stag/hen parties. Herefordshire Raceway is an outdoor tarmac go-karting circuit 600 metres in length with a bridge and tunnel. Herefordshire Raceway is located near the village of Weobley, and surrounded by beautiful Herefordshire countryside. It’s the perfect place to experience go-karting, whether it’s a fun day out, a launching pad to greater things, or as the thrill of a lifetime. 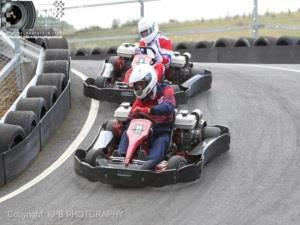 Undulating and challenging, the track offers the thrill of karting with twin engine pro karts for ages 8 – 80 years. Anyone fourteen years or older and 1.5 metres tall can drive the awesome twin-engine pro-karts up to 50mph. Children over the age of eight years and at least 1.3 metres tall may use the restricted twin engine pro-karts. Since the track was opened in July 2001 public interest has overwhelmed owners Graham and Gillian Powell. Indeed, the business is a family affair, being run by their son Chris, with support from a number of other motorsport enthusiasts. The business is a member of the National Karting Association and welcomes their professional support in improving service and safety standards. Herefordshire Raceway is situated 1 mile north of Weobley, just off the A4112 Leominster to Brecon road. Turn off the A4112 on seeing the "Kart Track" signpost and follow the road for three-quarters of a mile leading to the circuit.